We also have an extensive personal injury practice at our law office, where we advocate for people who have suffered due to motor vehicle accidents, defective products and other negligence. Our team includes former prosecutors who know the justice system inside and out at both the state and federal level. This gives us an edge when negotiating with the state on behalf of a client, as well as anticipating the path a case may take when going to trial. 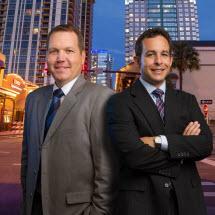 Moses and Rooth Attorneys at Law has earned several collective and individual honors from the legal community, including earning the highest peer rating possible of AV Preeminent* from Martindale-Hubbell, holding an Avvo "Superb" rating and being named Super Lawyers. Our law office prides itself most, however, on the countless clients whose futures have been protected as a result of our efforts.